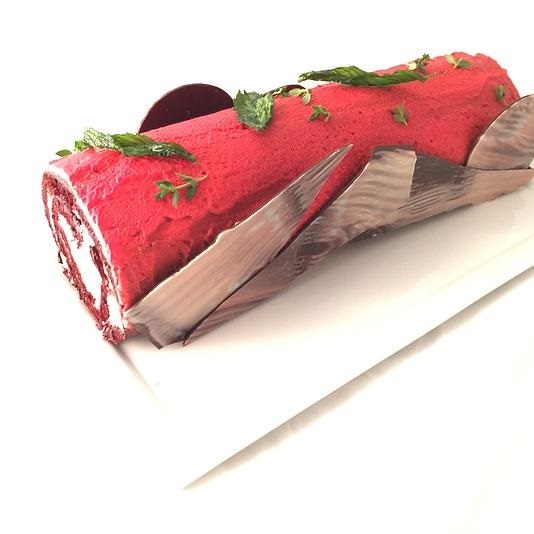 This iconic French dessert, which dates back to the 19th century, is a roulade sponge cake, with a fruit, chocolate or hazelnut filling, in the form of a yule log, typically covered with icing, buttercream or a ganache, and then decorated to resemble a forest-like scene with fun and edible adornments ranging from a dusting of powdered sugar to represent snow to meringue mushrooms. Today, this cake has become a culinary masterpiece as evidenced by pastry chefs around the world and their avant-garde interpretations on this sweet delicacy. Some are just so exquisite and creative that they could easily be centerpieces. Need proof? Then, just check out these 2015 beauts. Bûche de Noël Description: A green matcha tea sponge cake with the following flavor choices : chocolate, chestnut, blackcurrant, on an almond biscuit topped with small meringue mushrooms. Available: Christmas Eve and Christmas Day (the weekend before it may be a 'special' on the dessert menu). Price/Servings: $10 per slice at the restaurant or you can order the entire Bûche de Noël for $38 for 4 people or $55 for 6 people but it needs to be ordered one week in advance. 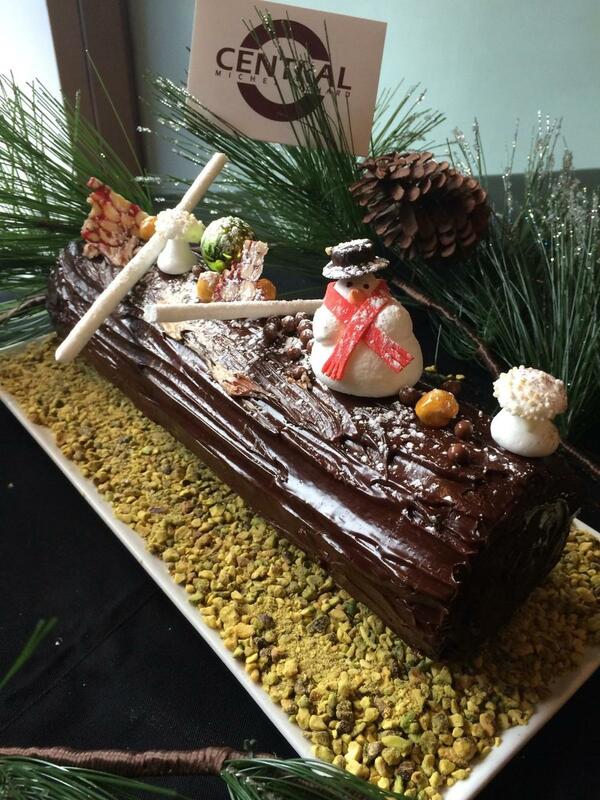 To make a reservation at the restaurant, go here or to order the Bûche de Noël, call 202-237-2300. Bûche de Noël Descriptions: Lemon Champagne, a flavorful almond sponge cake with lemon champagne mousse and raspberry pate de fruits, with a raspberry glaze. || Chocolate Black Forest, a decadent chocolate almond with chocolate mousse, kirsch mousse, candied cherries, brandied cherry marmalade. Both are outfitted with meringue mushrooms, fresh berries, chocolate shavings and a gold leaf. Available/Ordering: The entire Bûche de Noël can be ordered from December 1 to December 16 and picked up on December 23 after 12 noon. To reserve, you can call Le Diplomate at 202-332-3333 or you can order it at the restaurant. Price/Servings: Available for $46 and serves 4-6 people. Bûche de Noël Description: French Christmas sponge cake, wrapped around layers of chocolate mousse and soaked in rum and decorated with holiday meringues (mushrooms and Central's famed snowman). 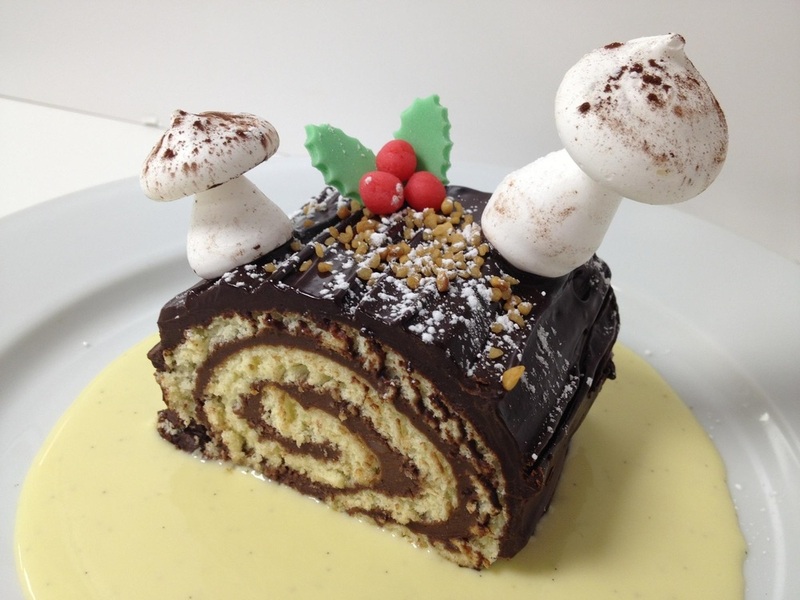 Available/Ordering: Slices of the Bûche de Noël can only be ordered on Christmas Eve. You can make a reservation here. Bûche de Noël Descriptions: Chalet, almond sponge cake, chocolate hazelnut mousse and praline. || Raspberry Nougat, raspberry chocolate sponge cake, vanilla genoise and raspberry mousse. || Coffee Nougatine, almond coffee sponge cake, coffee buttercream and nougat. || Chocolate Mousse, almond chocolate sponge cake and dark chocolate mousse. 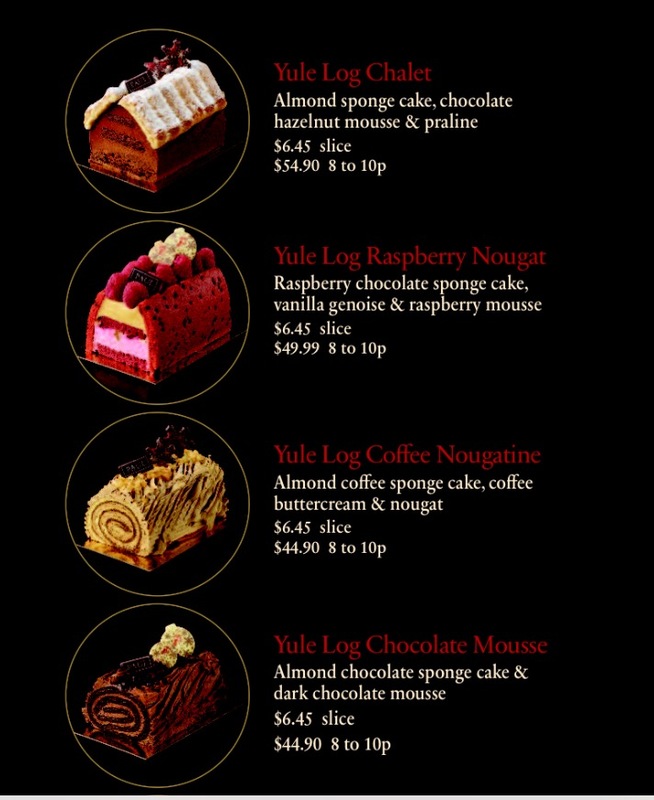 Availability/Ordering: By the slice or the entire Bûche de Noël. To reserve, you can call your local PAUL bakery. Locations can be found here. Price/Servings: $6.45 per slice OR you can purchase an entire buche for the following prices $54.90 (Chalet); $49.99 (Raspberry Nougat); $44.90 (for both the Coffee Nougatine and Chocolate Mousse). Each serves 8 - 10 people. Bûche de Noël Descriptions: Winter, spice cake, eggnog mousse, meringue mushrooms and caramelized nuts. || Red Velvet, red velvet cake, cream cheese mousse and chocolate bark. || Belgian Chocolate, chocolate cake, dark chocolate mousse, raspberry gelee and dark and white truffles. Available/Ordering: They can be ordered today. Let them know which date you'd like it for, allow a minimum of 2 days notice when ordering, and they can be picked up at any time after noon. To reserve you can call B Too at 202-627-2800, send an email at info@btoo.com or visit their shop. You can find the ordering form here. 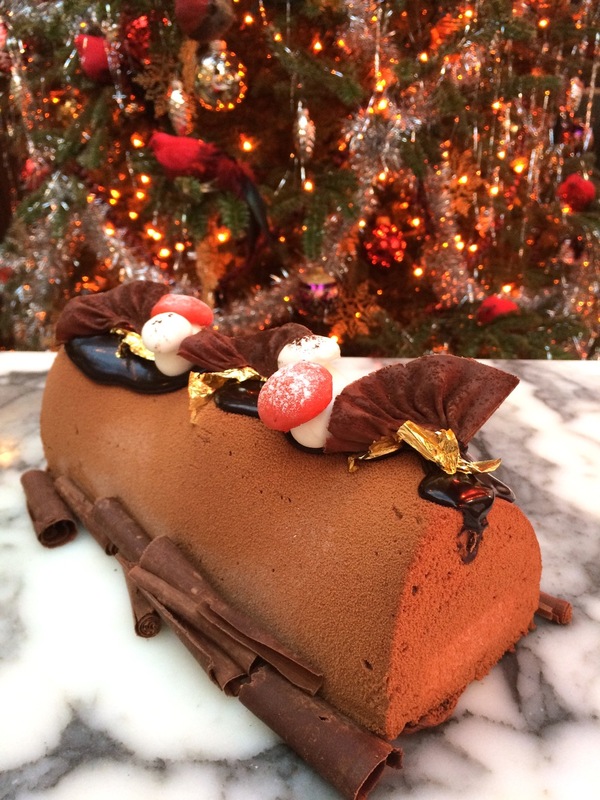 Price/Servings: There are two Bûche de Noël servings available. Either $36.50 for 4 - 6 people or $56.50 for 10 people. Bûche de Noël Description: White chocolate mousse, peppermint, a chocolate biscuit and a crispy meringue. Availability/Price: A holiday dessert option on 2941's Christmas Eve three-course prix fixe menu at $85. You can make your reservation here or you can call 703-270-1515. I'd like to introduce you to the regal Marie Antoinette Bûche de Noël from one of the most well-known luxury bakeries - La Durée. Based in France with U.S. presence in New York City and Miami and in 2016, La Durée is coming to Washington, D.C., more specifically Georgetown. So if you are in either of those cities for the holidays or if you just want to plan for next year's Christmas in D.C., then I highly recommend that you keep this on your radar. The below is the individual size and not only is it gorgeous, but it was delicious! Bûche de Noël Description: Macaron biscuit, rose petal cream, raspberry jam, lychees and raspberries. and treat yourself to one of these incredible Bûches de Noël !